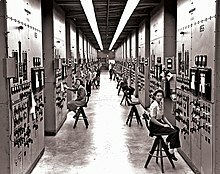 Employees of the Manhattan Project operating calutron control panels at Y-12, in a US government photo by Ed Westcott. Y-12 is the World War II code name for the electromagnetic isotope separation plant producing enriched uranium at the Clinton Engineer Works in Oak Ridge, Tennessee, as part of the Manhattan Project. Construction began in February 1943 under the management of Stone and Webster. Because of a wartime shortage of copper, the massive electromagnetic coils were made with 14,700 tons of coinage silver from U.S. government vaults at West Point. Colonel Kenneth D. Nichols met with the Under Secretary of the Treasury, Daniel W. Bell, and requested between five and ten thousand tons of silver. Bell's stunned reply was, "Colonel, in the Treasury we do not speak of tons of silver; our unit is the troy ounce." Thus the Manhattan Engineer District requested and was loaned 395 million troy ounces of silver (13,540 short tons, 12,300 tonnes) from the West Point Depository for the duration of the Manhattan Project. Special guards and accountants were assigned to the silver, and their responsible caretaking meant that at the end of the war, less than 0.036% out of more than $300 million worth of silver was lost to the process, with the remainder returned to the Treasury. The Y-12 facility began operating in November 1943, separating uranium-235 from natural uranium, which is 99.3% uranium-238, by using calutrons to perform electromagnetic isotope separation. Y-12 separated the uranium-235 for Little Boy, the nuclear weapon that was dropped on Hiroshima, Japan on August 6, 1945. K-25, another facility in Oak Ridge, produced enriched uranium using gaseous diffusion. However, K-25 did not begin operating until March 1945 and fed slightly enriched uranium to Y-12's Beta Calutrons as the push to obtain enough uranium 235 for Little Boy came in the early summer of 1945. The S-50 Thermal Diffusion Plant at the K-25 site also provided feed material for Y-12's Beta Calutrons. Tennessee Eastman was hired by the Army Corps of Engineers to manage Y-12 during the Manhattan Project. The company transferred scientists from Kingsport, Tennessee to Y-12 and operated the plant from 1943 to May 1947. The Y-12 electromagnetic plant units were initially operated by scientists from Berkeley to remove bugs and achieve a reasonable operating rate. They were then turned over to trained Tennessee Eastman operators who had only a high school education. Nichols compared unit production data, and pointed out to physicist Ernest Lawrence that the young "hillbilly" girl operators were outproducing his PhDs. They agreed to a production race and Lawrence lost, a morale boost for the Tennessee Eastman workers and supervisors. The girls were "trained like soldiers not to reason why", while "the scientists could not refrain from time-consuming investigation of the cause of even minor fluctuations of the dials". The Union Carbide corporation succeeded Tennessee Eastman as the operating contractor in 1947, remaining until 1984, when Union Carbide relinquished the contract for operating DOE's Oak Ridge facilities, and the Martin Marietta corporation (later Lockheed Martin) won the contract to take over the operation. BWXT Y-12 (name later changed to B&W Y-12) succeeded Lockheed Martin as the Y-12 operator in November 2000. A chemical explosion injured several workers at the Y-12 facility on December 8, 1999, when NaK was cleaned up after an accidental spill, inappropriately treated with mineral oil, and inadvertently ignited when the surface coating of potassium superoxide was scratched by a metal tool. At 11 p.m. on 16 June 1958 a criticality accident occurred in the C-1 Wing of Building 9212 at the facility, then operating under the management of Union Carbide. In the incident, a solution of highly enriched uranium was mistakenly diverted into a steel drum, causing a fission reaction of 15–20 minutes duration. Eight workers were hospitalized for moderate to severe radiation sickness or exposure, but all eventually returned to work. In June 1960 the eight workers, Bill Wilburn, O. C. Collins, Travis Rogers, R. D. Jones, Howard Wagner, T. W. Stinnett, Paul McCurry, and Bill Clark filed suit against the Atomic Energy Commission. The suit was settled out-of-court. Wilburn, who had received the highest radiation dose, was awarded $18,000. Clark received $9,000. Under the Energy Employees Occupational Illness Compensation Program, the eight later received additional compensation from the government; Clark collected multiple payments totaling about $250,000. Most, if not all, of the eight victims were diagnosed with cancer at some point during their lives. As of June 2014, Clark was the only surviving member of the eight. Y-12's primary missions since the end of the Cold War have been to support defense needs through stockpile stewardship, assist on issues of nuclear non-proliferation, support the Naval Reactors program, and provide expertise to other federal agencies. Y-12 is also responsible for the maintenance and production of all uranium parts for every nuclear weapon in the United States arsenal. Y-12 is responsible for the production and maintenance of the "secondary" aspect of thermonuclear devices. Y-12 has a history of providing secure storage of nuclear material for both the United States and other governments. Early efforts focused on securing material from the former Soviet Union; recent activities have included recovery of highly enriched uranium from Chile. Environmental cleanup has been an ongoing issue for the Department of Energy in Oak Ridge. The Y-12 plant was listed as an EPA Superfund site in the 1990s for groundwater and soil contamination. Today, the Y-12 plant is listed on the DOE's Cleanup Criteria/Decision Document Database (or C2D2 database). An influx of funding from the American Recovery and Reinvestment Act benefited cleanup efforts by funding demolition and decontamination of aging facilities. These efforts work to further the long term reduction in the size of the Y-12 facility. CNS Y-12 currently[when?] employs approximately 4,700 people. About 1,500 additional personnel work onsite as employees of organizations that include UT-Battelle, Science Applications International Corporation, Bechtel Jacobs, UCOR, and WSI Oak Ridge (an American-controlled unit of G4S Secure Solutions), which holds the security contract for the site. Since 1988, Oak Ridge Environmental Peace Alliance has organized non-violent direct action protests at the Y-12 Complex, in an effort to close down the weapons plant. Sister Mary Dennis Lentsch, a Catholic nun, has been arrested many times for protesting at the Oak Ridge facility. She has said, "I believe the continuing weapons production at the Y-12 National Security Complex in Oak Ridge, Tennessee, is in direct violation of the treaty obligations of the United States and consequently, is a violation of Article 6 of the U.S. Constitution". In 2011, the Rev. William J. Bichsel, an 84-year-old priest, received a prison sentence of three months for trespassing on federal property at the Y-12 complex. In 2012, there have been protests about the proposed new Uranium Processing Facility, which is expected to cost $7.5 billion. In July 2012, Megan Rice, an 82-year-old nun, and two fellow Plowshares activists entered the Y-12 complex and spray-painted anti-war slogans on the exterior of the Highly Enriched Uranium Materials Facility, a structure for storage of weapons-grade uranium. The anti-nuclear activists, who got past fences and security sensors before dawn on July 28, spent several hours in the complex, conducted a Christian peace ritual before they were stopped by a lone guard. The security breach prompted private experts to criticize the Department of Energy’s safeguarding of nuclear materials. The agency is to reappraise security measures across its nuclear weapons program. The DOE-OIG found that all of the defenses for the plant were insufficient and that the security response had "troubling displays of ineptitude". On May 9, 2013, the three were convicted of sabotage. In her testimony Rice said "I regret I didn't do this 70 years ago." ^ "A Visit to the Secret Town in Tennessee That Gave Birth to the Atomic Bomb". New Republic. Retrieved November 15, 2017. ^ "About". CNS – Consolidated Nuclear Security, LLC. Retrieved September 9, 2017. ^ Nichols, Kenneth D. (1987). The Road to Trinity. Morrow, New York. p. 42. ISBN 0-688-06910-X. ^ "Eastman at Oak Ridge - Dr. Howard Young". Archived from the original on March 18, 2011. Retrieved January 6, 2017. ^ "14,700 tons of silver at Y-12" (PDF). Archived from the original (PDF) on October 27, 2014. Retrieved December 9, 2009. ^ Martha Avaleen Egan, Tennessee Eastman Company/Eastman Chemical Company, Tennessee Encyclopedia of History and Culture, 2009. Retrieved: 14 February 2013. ^ "Y-12 Receives 'Good' Award Fee Rating from DOE Archived February 8, 2007, at the Wayback Machine," BWX Times, Vol. 2, No. 6 (10 January 2002). Retrieved: 14 February 2013. ^ "Type A Accident Investigation of the December 8, 1999, Multiple Injury Accident Resulting from the Sodium-Potassium Explosion in Building 9201-5 at the Y-12 Plant" (PDF). U.S. Department of Energy. February 2000. ^ a b Munger, Frank, "Nuclear survivor: Clark recalls 1958 accident at Y-12 and up-and-down life that followed", Atomic City Underground, 14 June 2014; also published in Knoxville News Sentinel and Stars and Stripes. ^ Hoffman, David E. (September 21, 2009). "Half a Ton of Uranium -- and a Long Flight". The Washington Post. ^ Frank Munger, "Three from Y-12 Helped Secure Chile's HEU Archived July 19, 2010, at the Wayback Machine," Knoxnews.com, 8 April 2010. Retrieved: 14 February 2013. ^ Frank Munger, "Y-12 Stimulus Fund Grows, New Projects May Follow," Knoxville News Sentinel, 18 August 2010. Retrieved: 14 February 2013. ^ John Huotari, "Officials Say Uranium Processing Facility Supporters Outnumber Opponents," 30 November 2009. Retrieved: 14 February 2013. ^ "Nun sentenced for protesting nuke plant - US news - Crime & courts - NBCNews.com". Retrieved August 28, 2012. ^ Matthew L.Wald (August 7, 2012). "Security Questions Are Raised by Break-In at a Nuclear Site". New York Times. ^ Munger, Frank (February 17, 2014). "18 months after security breach, former Y-12 nuclear weapons plant boss tells his story". www.stripes.com. Knoxville News-Sentinel, Tenn. Retrieved February 17, 2014.